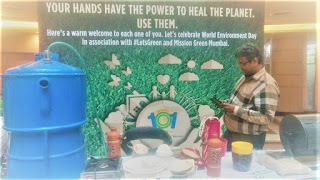 June 2, Mumbai: Growel’s 101 Mall in Kandivali took a step in the direction of a greener and more enriched environment by designing a unique initiative in association with the people's movement Mission Green Mumbai. The venture aimed at urging and encouraging people to save the environment through an array of activities that could go a long way in restoring the city’s green cover. On Friday and Saturday, environmental experts conducted several sessions in the premises of the mall that showed citizens various ways to contribute towards protecting the environment. These included sessions on Self Watering Planters or those types of plants that require watering only once a week, How to create your very own Vertical Garden, Composting, Waste Management, Rain Water Harvesting, Saving trees from Concretisation etc. To ensure that people have the right information on the topic, a quiz session was also conducted that added a fun element to the event. A painting competition on the topic ‘Save Trees’ was also held for children. While the guidance sessions were well received, an exhibition on composting, self-watering planters and rain water harvesting also attracted several people who came to satiate their curiosity and learn new things to save the environment. In addition, citizens were made to create Self Watering Planters in the Waste Plastic Bottles collected by the mall from their food outlets, staff and customers. They were made to plant saplings in the same which were distributed to the citizens. Plans are also on cards to collect manure from the waste and pack it with fruit seeds and distribute it throughout the year. The initiative also encouraged people to Say No To Plastic and opt for greener materials that are not detrimental to the environment. Mission Green Mumbai​ has been involved in many such ventures in the city through which more than 20,000 trees have been planted and close to 100 such events have taken place. Citizens can approach the organisation and its experts to learn more about these activities.